This Reference Article defines and explains the topic of the Direct Print Method of printing labels from TEKLYNX products including CODESOFT, SENTINEL, TEKLYNX CENTRAL, LABELVIEW, and LABEL MATRIX. The Direct Print Method of printing labels is a printing option offered by TEKLYNX. Since TEKLYNX creates their own printer drivers, their software can generate the direct printer code (i.e. ZPL, IPL, etc.) for most major brands of thermal printers (Zebra, Sato, DataMax, Intermec, and many others). This allows the user the option to bypass the Windows printing subsystems (Windows Spooler and Windows print drivers) and send the print job directly to the printer port defined within the TEKLYNX software. Faster to set up printer – no need to install Windows drivers and/or setup a Windows print queue in Devices and Printers. Easier to insert additional printer code (via the TEKLYNX driver) – allows user to pass special print commands to the printer such as ‘delete all pending print jobs’. More flexibility in manipulating the printer code (i.e. easier for third party applications to modify the code) – easier for other applications to capture the print job and substitute values since the print job file is in ASCII text using published printer commands. 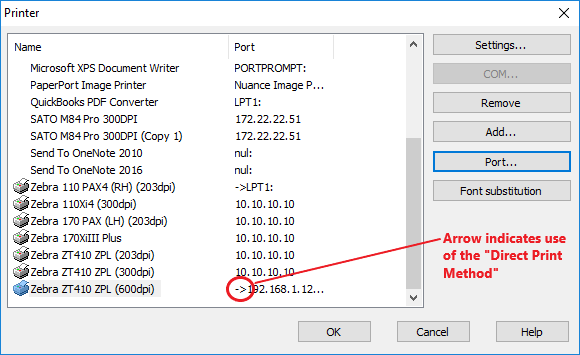 Easier for print jobs to get ‘lost‘ – without the Windows printing subsystems involved, print jobs sent over the network are not managed. Thus if there is a problem in communication, the print job can be corrupted or completely lost. Not all printers can use this method – although TEKLYNX does cover a very broad range of thermal printers, there are few options for color inkjet or laser printers. When creating a Direct Print Method printer, it is highly recommended the user take advantage of the Test Connection button to verify there are no connection issues. Since this method bypasses the Windows printer subsystems, the user will not have the benefit of Windows messages or logs to troubleshoot connection problems. There are times when a user may which to use TEKLYNX drivers and the Windows Spooler (to manage print jobs) but not use the Windows drivers. The create a Windows Spooler without using Windows print drivers, the user needs to create a port in Windows BEFORE setting up the printer in the TEKLYNX software (e.g. CODESOFT). When the TEKLYNX driver is connected to an existing Windows port in CODESOFT, CODESOFT creates a Windows Spooler queue and typically names it “THT_XX”. When looking at the list of printers in TEKLYNX, you will notice that TEKLYNX shows all available Windows printer options installed on the computer with the additional TEKLYNX Direct Print options. The TEKLYNX Direct Print printers have an arrow preceding the port name in in the Port column of the Printer selection screen.